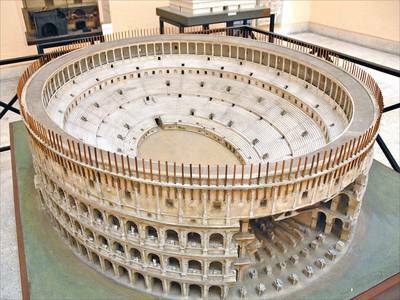 The Colosseum is the name given to the amphitheater of the city of Rome. Its name comes from the word 'Colosse', which designates a particularly tall and strong being. 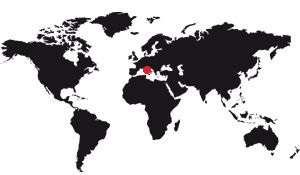 (See the Colossus of Rhodes, one of the 7 wonders of the world, which is a pretty good word as it is really big and impressive, it is also the greatest of all amphitheatres of the Roman Empire. 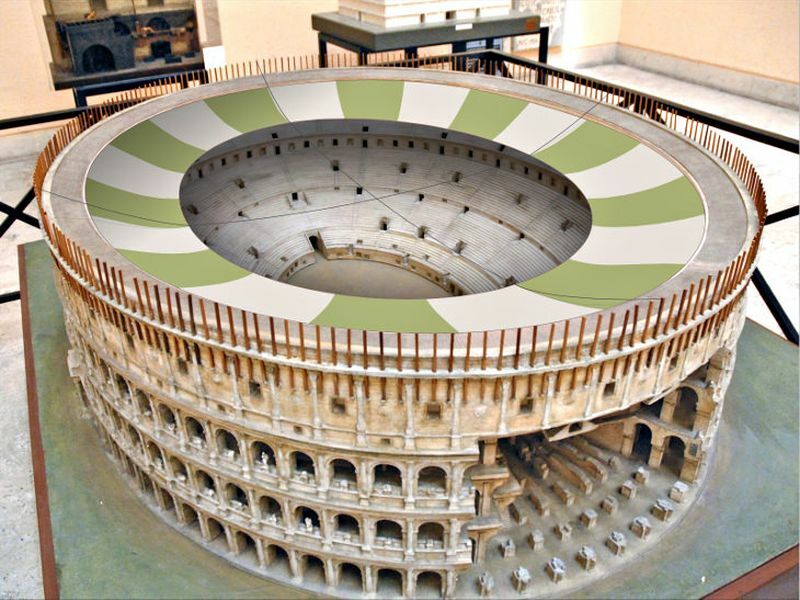 All Roman amphitheatres are similar, they are all ovoid (ie egg-shaped). An arcaded wall runs around it, quite vertical and quite high, and the interior is made up of an oval arena from which staggered terraces start. If initially there were only two floors in the Colosseum, the emperor Domitian quickly built a third floor, with wooden steps, to increase its capacity. He also had the hypogeum built, that is, the basements of the arena, which correspond to the backstage of our modern theaters. The architecture of the Colosseum shows an ovoid plane, that is to say in the shape of an egg. It is an ellipse with several centers, but of a general appearance it is quite close to an oval plane. The longest length is 187.75m and its width 155.60m, for a constant height of 50.75m. It consists of an amphitheater block encircling an arena surrounded by a facade that goes around. There are four floors. The space between the amphitheater and the facade is made of two adjoining circular corridors per floor. The facade and interior corridors are pierced with 80 arches of large sizes, arches vaulted semicircular separated from each other by decorated half-columns. This succession of arches exist only on the first three levels, the fourth, posterior, is a solid wall, a piece of architecture that is called "Attic" and which is pierced by small rectangular windows to the rhythm of an arcade out of two. At the top there is a stone installation to maintain a mat vertically Repeated 240 times, this installation formed a crown of vertical poles between which we could stretch a canvas: The velarium. The bleachers were distributed along the curve of the amphitheater. The seats closest to the arena were 3m high, the wall that was separated is called a podium. From the first row to the last, we cross 7 concentric rings, bigger and bigger as we go up the floors. These rings are the structure of the building, they rest on arches unloaded by walls of stones which are perpendicular to them. The higher you climb the floors, the higher the altitude curve increases its coefficient: It means that the higher you are, the more you are "above" the person in front, while below, we are rather "behind" that person. The facade of the Colosseum is beautiful, it consists of 4 levels, the first three are opened by arcades. The lower ones are more than 7m high by 4.2 wide, while those on the second and third floors are 6.45m high, still 4.2m wide. The constant of the width makes it possible to have no shift from one stage to another. On the ground floor arcades are numbered from 1 to 76, because 4 of them are special, these are the main entrances. These main entrances were equipped with a statue and had decors of better qualities than the others. The Doric style is the simplest, the most refined. The columns are 20 vertical ribs and the capitals are not decorated. The ionic style is 24 ribs, and the capitals are decorated with scrolls. The Corinthian style, it corresponds to the Baroque, it is a style overloaded with leaves of stylized trees. The use of these three styles probably show the will of the manufacturer to highlight the artistic evolutions known during antiquity. The four levels are separated from each other by a stone floor opening on the outside by a projecting cornice without decoration. The fourth level is special. Externally it does not have arches, it is only a straight wall pierced with small rectangular windows at regular intervals, in fact both arcades of the lower levels. In architecture we call it an attic. The attic was used to expose large decorative shields, much like an exhibition wall. At the top of the Colosseum there is a rather large cornice that goes around it. It was pierced by 240 holes (there are still some of them today). Below each there is a small corbell, approximately 1.5m from the cornice. It served as support for the masts protruding from the summit. These masts went through the holes and were irremovable. Strings were stretched out to open or close a shade cloth, the velarium. The facade is the most beautiful part of the Colosseum, although much of it has been destroyed, despite the outrage it has received. The Cavea is the name given to the hole formed in the center of the amphitheater, so it's inside the Colosseum. Nowadays the cavea is strongly degraded, and only a very small part of the stands has been rebuilt, to better understand what it used to be. The stands were divided into rows along concentric lines. The lowest was 3m high compared to the arena, the highest at more than 40m. As the vision was better down, the seating was done by sector corresponding to a concentric ring, knowing that there were 7. The Emperor was of course all at the bottom while the plebs was at the top. The stands were stepped on a logarithmic slope, as is the case in modern theaters. At the base, the slope is only 30 ° while at the top, it is 40 °. The stands were not equipped with seats, they were only stone benches. Spectators often brought their chairs to have the best possible comfort, knowing that the days at the amphitheater were long. 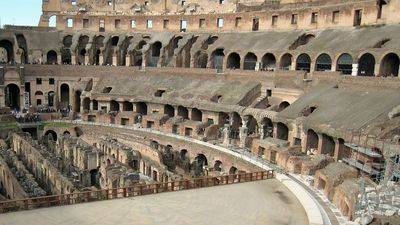 To improve comfort the Colosseum was equipped with 70 water fountains and food vendors were running during the shows. Since the monument could accommodate up to 70,000 people, it was necessary to be able to manage the flows efficiently. It was the role of the vomitorium, which are corridors to get the spectators out. Their numbers were calculated in relation to the experiences of other Roman Empire amphitheatres, so that it did not take more than 5 minutes to completely empty the Colosseum when needed. The flow of spectators were particularly studied. Since each social class had its platform, it was not necessary that they could cross each other in the corridors, so everyone had their own entrances, stairways and corridors that took him to his place. Social classes could never mix at the Colosseum. There is a special corridor, it is behind the podium from which it sometimes emerges as a niche. It is still unclear what it could serve, but some researchers think it could be a service gallery to position the archers in charge of the safety of the spectators, vis-a-vis the wild animals. This corridor was not intended for the public since it was only accessible from the staff level. Moreover the cavea was built in 4 parts corresponding to 4 quarters of the oval. What is surprising is that there is a homogeneity of construction between each quarter, slightly different from the others. It is thought that all these quarters were built together but on the orders of 4 different architectures. It's a pretty original way to build such a building and that explains these slight differences. The arena is oval, it measures 83m long and 48 wide. The floor was a floor, sometimes replaced by brick on some places. For the games that took place there was covered with 20 to 25cm of sand that old representations show rather packed, people do not sink in. Sometimes, for certain special occasions, shiny particles were mixed with the sand, which made it look special. The arena was 3m lower than the first stands, it was for the safety of the spectators. But sometimes it was not enough, since wild animals can, when cornered, make prodigious leaps. To avoid this we added a net around the first ranks, and there were always archers in place to kill the animal who managed to climb the stands. The danger always came from the animals, the gladiators, they were professionals who did not try to attack the lives of the spectators. The 3m wall that elevates the stands is called a podium, in architecture. The different sets were brought in different ways in the arena, one of them used lifts. And yes, there were several elevators at the Colosseum, it was mechanical machines that raised cages in which were placed what we wanted to climb in the arena. If they were used for decoration, it was also used to mount wild animals. The hypogeum is the name given to the cellars of an ancient building, it is the underground part. That of the Colosseum was made in a second time, after the inauguration, under the emperor Domitian. It follows the contours of the arena and consists of a major axis that runs through it. On each side there is a succession of corridors leading to rooms. The outer hallway is bordered by a succession of niches that were built in brick foundations. The hypogeum of the Colosseum is a real Swiss cheese, there are passages everywhere. The disadvantage is that it has been reworked several times in its history, for example the fire that ravaged the building in 217 AD. It is therefore impossible to know exactly the function of each room, each corridor, especially since they had to change with the story. The current state of the hypogeum makes it possible to see the corridors, the passages, under the arena, the latter having been reconstructed only partially. But the hypogeum was not content with being on the arena, it was also under the corridors of the Colosseum itself, but only a small part. In fact, the part under the bleachers, at the end of the arena, on a fairly short arc. These two parts contained other rooms, rather small west sides, rather spatieuses East sides. The underground function is our modern backstage. 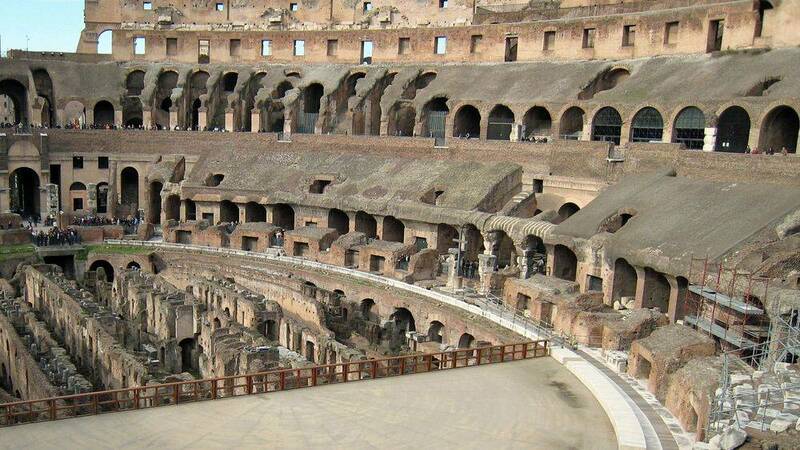 They stocked the equipment for the maintenance of the Colosseum, but especially the elements of the show that took place, the actors settled there while waiting for their passage, the gladiators were preparing, and there was stored the costumes, necessary accessories for shows. There were also cages for wild animals as well as others for death row prisoners. The Colosseum uses several materials. The main one is travertine, a limestone, marble, for decorations, tuff, volcanic rock, brick, and lime for links. We also used metal, mainly bronze, to bind the stones together. The velarium is the canvas that was stretched at the top of the Colosseum to house the spectators of the Sun. But how to stretch a canvas at 50m height, on the length described by an oval 500m long? It is still the Roman genius that will solve the problem. 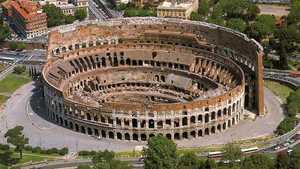 If we look at the Colosseum nowadays, we can see that there is a corbelling at 2m from the top, in the form of a projecting stone all around the facade. There are 240 exactly, and they echo a hole in the cornice, all at the top. In Roman times, 240 masts were planted as support for a calculated entanglement of ropes around the amphitheater, leaving a central hole. Sections of canvas could slide on these ropes, opening or closing this kind of "removable roof". The ropes were maneuvered by sailors helped by slaves. This profession was the most likely to perform this task, being similar to the ropes of boats. They were part of the imperial fleet, they were based at the barracks Castra Misenatium. To attach the ropes we used large blocks of mooring outside the Colosseum, they still exist, partially. Note that experts do not all agree because some believe that these blocks were primarily used to regulate the flow of visitors on busy days. Photos and reconstruction of the Velarium: Jean-Pierre Dalbéra.